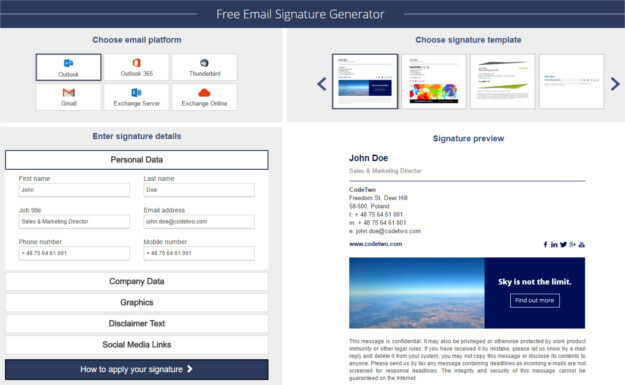 How to have an Office 365 email signature inserted only into new emails? This entry was posted in Design, Microsoft Office 365, Tips and tagged business email signature, email signature, email signature guidelines, email signature management, mail flow rules, new emails, professional email signature, signatures under replies, tips on July 13, 2017 by Adam the 32-bit Aardvark. Have you ever tried to create a perfect email signature for your entire company? If so, you probably know that designing a good signature is sometimes far more complex than building a complete website. And this is because different email clients have their very own way of interpreting the HTML code you wrote, which makes the signature design be a far cry from what you expected. However, there are several rules that you can follow to achieve better results. Let’s get started. To design your signature, you would need an HTML editor. The standard Windows Notepad is enough, but an editor with syntax highlighting and automatic completion (like Notepad++ or Sublime Editor) will be a much better option. This entry was posted in Design, Tips and tagged design, how to, html signature, professional email signature on April 12, 2017 by Adam the 32-bit Aardvark. This entry was posted in Design and tagged create signature, email signature generator, professional email signature on March 31, 2017 by Adam the 32-bit Aardvark. No matter what professional you are – a marketer, a lawyer, a coach, a graphic designer or maybe a freelancer – you need an adequate email signature to use in every email you send to the outside world. Email signatures in business communication not only allow to pass relevant contact information to quickly communicate with you, but also carry a great potential to showcase your abilities, achievements, or certificates. In this article, you will find some tips on how to design an email signature for professionals. This entry was posted in Tips and tagged business email signature, email signature guidelines, for professionals, professional email signature on February 23, 2017 by Milena Szyrwiel.